Being a competent pilot-navigator is the very essence of piloting. The foundation upon which sound pilot-navigation skills are built is meticulous flight planning. The principal aims of this book are to teach you the theory and practice which underpin successful flight planning, and the art of single-pilot, visual navigation, as well as to prepare you for the theoretical knowledge examinations of the Private Pilot’s Licence (PPL), and beyond. 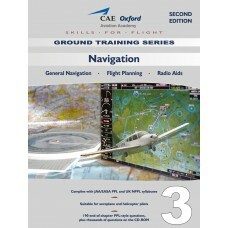 To this end, the book consists of two sections; the first section deals with dead reckoning visual navigation techniques, that every pilot must master, and the second section is an introduction to radio-navigation aids. Accompanying the book, is an interactive CD-ROM which teaches you how to use the analogue navigation computer which is used in the theoretical knowledge examinations, and which is still a firm favourite of many practising pilots. The CD-ROM contains thousands of self-test questions on the functionality of the navigation computer. These are, in addition, more than 170 end-of-chapter PPL-style questions.